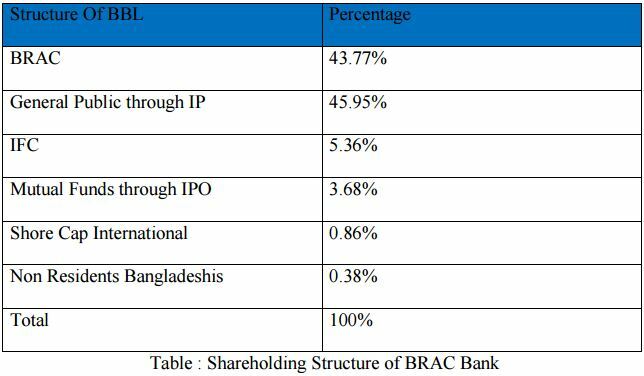 BRAC Bank Limited, one of the latest generation of commercial banks started its journey on July 04, 2001 which is an affiliate of BRAC, the world‟s largest nongovernmental development organization founded by Sir Fazle Hasan Abed in 1972. Though is the pioneer of SME loan in Bangladesh but the Retail Banking Division of BRAC Bank enhanced it‟s footprint day by day with a superior consciousness. The report is all about the analysis of Zero Balance and Dormant Project of BRAC Bank Limited where it mentioned all the important aspects of why the Zero Balance and Dormant Project were initiated, it’s target customers, the gap of this project and how to mitigate those gaps. Basically, the goal of Zero Balance and Dormant project is to increase the active number of accounts, to decrease dormant account numbers. Worked as an intern I have gathered different experiences in BRAC Bank which also include in this report with my job duties and responsibilities. After that, the report has some recommendation which I have realized in the time of doing internship and also preparing the report. Finally, it can be said that the Zero Balance and Dormant project get the ultimate success due to its dedication, commitment and dynamic leadership of the management committee. BRAC Bank Limited is a first going third generation scheduled commercial bank in Bangladesh. It was established in Bangladesh under the Banking Companies Act, 1991 and incorporated as a private limited company on 20th May1999 under the CompaniesAct,1994. The primary objective of the Bank is to provide all kinds of banking business. At the very beginning the Bank faced some legal obligations because the High Court of Bangladesh suspended activity of the Bank and it could fail to start its operations till 3rd June 2001.Eventually, the judgment of the High Court was set aside and dismissed by the Appellate Division of the Supreme. The Bank has started its operations from July 04, 2001. The Chairman of the Bank is Sir Fazle Hasan Abed. Now the Managing Director & CEO of the bank is Mr. Syed Mahbubur Rahman. The bank has made a reasonable progress due to its visionary management people and its appropriate policy and implementation. BRAC Bank is a commercial scheduled bank extending full range of banking facilities as per the directives of Bangladesh bank. It intends to set standards as the absolute market leader by providing efficient, friendly and modern, fully automated on- line service on a profitable basis. BRAC Bank Ltd is a fully operational commercial bank; it focuses on pursuing unexplored market niches in the Small and Medium Enterprise Business, which till now has remained largely untapped within the country. In the last five years of operation , the bank has disbursed BDT 1,500 Crores in loans to nearly over 50,000 SMEs. The management of bank believes that this sector of economy can contribute the most to the rapid generation of employment in Bangladesh. The Bank has grown to 157 branches, over 421 SME Unit offices and 332 ATM sites across the country. The Bank is constantly coming up with new products. Recently BBL has introduce Visa Silver and Visa Gold both local and international credit cards; and further more the bank is in the process of introducing VISA Debit card. In the years ahead BRAC Bank expects to introduce many more services and products as well as add a wider network of SME unit offices , Retail Branches and ATMs across the country. The bank incorporated on 20th May , 1999 as a public limited company under Companies Act, 1994 with multinational collaboration including International Finance Corporation (IFC) of The World Bank Group & Shore Cap. The unique strength of BRAC Bank lies in the fact that BRAC one of the world‟s largest private development organization is its key shareholder and the bank‟s vision are thus aligned with those of BRAC. In the recent past the bank has gone public with price of shares reaching impressive heights , further showing promising future. The reason BRAC Bank is in business is to build a profitable and socially responsible financial institution focused on markets and business with growth potential, thereby assisting BRAC and stakeholders build a “just enlightened, healthy ,democratic and poverty free Bangladesh.”BRAC Bank fulfills the purpose by reaching for high standards in doing everything for their customers, shareholders, associates and communities upon, which the future prosperity of their company rests. Business: These sectors basically deal with the valuable customers of the bank and interact with them on daily basis. The daily transactions for the bank are handled by these departments. 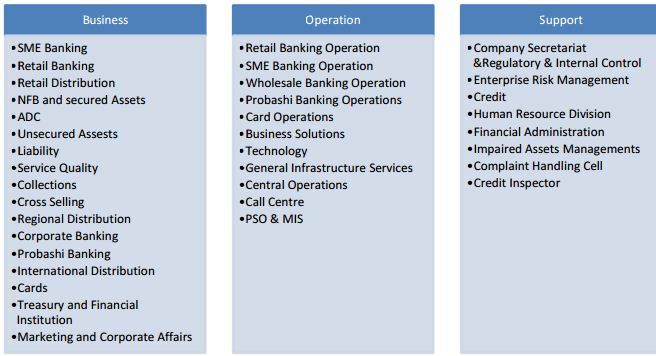 Operation: These sectors generally deal with technicalities of the relevant sectors and ensure smooth functioning of the business for the bank. Support: These sectors provide support to the business by ensuring the proper functioning of the various resources, risk management and banking regulations. As the main product of BRAC Bank Ltd is SME, BRAC Bank has a strong SME focus and has developed a wide range of SME business products, these are customized for specific localized small and medium business across the country. The SME loan products cover a range of rural, semi-urban and urban financial needs in the market. Besides them, industries, transport business, education institutions, medical centers, marine business, any other high worth companies, individuals, etc are also the main customers of the bank. The bank has the ATM card and Credit card facility, so the users of the same are also in target. The BRAC Bank Limited has different employee‟s criteria. There are different types of employees working in different places inside BRAC Bank. The types of employees are Regular Employee. The permanent stuffs are known as regular employees. The regular employees are allowed to get the bonus, incentives and other allowances with their basic salaries. And these types of employees also have the benefit of gating extra facilities the BRAC Bank limited is providing for their employees. HR temporary contract are for those categories whose Job description is such, where he/she needs to be under the direct supervision of Bank‟s authority, whose performance is monitored by the Bank Management. They might be specialist, consultant, and specially assigned staff. Staff under HR contract are those people who directly or indirectly deals with customer, has access to Bank‟s confidential datas & valuable properties (car, etc), deals with sensitive areas, also where staff need to deal with customer as a representative of BRAC Bank directly. The HR staffs salaries are fixed and they won‟t get any allowances with their salary. Other contractual employees are not entitled for any service agreement. They will be recruited through outsource agencies. The requirement of any support staff through outsource agency must come through HR signed by the Division Head. HR will send the requirement to provide staff by the Outsource Agency. Outsource Staff recruitment depends on the budgeted requisition of the staff from the respective departments. However, for non-budgeted requisition it will go through after the approval process of MANCOM. The bank reserves the right to terminate the contract with the Outsource Agency without assigning the reason whatsoever. The Outsource Staffs salaries are fixed and they won‟t get any allowances with their salary. To encourage and help human resource development in the financial industry the Bank may decide to offer internship programs to individuals or educational institutions. The decision to enter such an engagement will be decided by the MD& CEO on the recommendation of the Department Head. The HRD will prepare the proposal of such engagement with individual/institution and forward it to the MD& CEO for consideration with the recommendation of the Head of HR. Individuals engaged as Internees will be paid a consolidated Honorarium of Tk. 5000/- per month, as decided by the MD/MANCOM and will not be entitled to any other benefits. Managing Director and CEO will determine and analyze the necessity of intern on the basis of yearly budget and also requirement of special projects. As per requirements Department Head will make the intern requisition and after receiving intern requisition HR will take 15 days for an intern to join. All Internships program will be for a three months. Prior approval by MD& CEO internship program can be extended for a maximum period of six months. BRAC Bank, being the youngest bank, took a step to break away from usual tradition and tapped into the true suburb entrepreneurial initiatives. Today, with over 220,139 million of loans disbursed till date, BRAC Bank is country’s largest SME financier that has made more than 410,817 dreams come true. There are two kinds of SME Products in BBL. One of them is Loan Product and another one is Deposit Product. Foreign Exchange & Related Services. Probashi Banking division of the Bank caters the NRBs (Non- Resident Bangladeshi) not only by disbursing remittance but also offering ‘One Stop Banking Solution’ by creating a favorable environment and opportunity for the NRBs to make long-term financial contributions in the socio-economic progress of the nation. 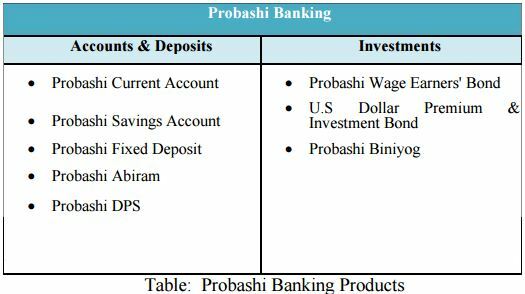 To facilitate the NRBs (Non- Resident Bangladeshi) a bunch of probashi banking products and services are designed to secure expatriate Bangladeshi(s) future saving(s) and investment(s) need as well as providing a structured financial planning for future. With over 86 branches, 300 ATMs and over 500,000 plastics in the market, BRAC Bank offers a wide range of financial solutions to meet our everyday need. Current Plus Account is a local currency non-interest-bearing current account with cheque book facility. The minimum account opening balance is BDT 25,000. There is no interest in this account. There is no Annual Account Maintenance Fee or any upfront fees. There is no Annual Debit Card Fees for this account if yearly average balance is BDT 25,000 or above. If customers do not maintain a Half Yearly Average balance of BDT 25,000, the account will be charged with BDT 500 + VAT every half year, on 1st week of January and 1st week of July of each year. Ezee Account is a local currency interest-bearing current account without cheque book facility. The minimum account opening balance is BDT 2,000. The interest rate in this account is 2% p.a., credited to the account Half Yearly. Any balance greater than zero will be eligible for interest. There is no Annual Account Maintenance Fee. Annual Debit Card Fee of BDT 600 + VAT will be charged upfront at the time of account opening and on anniversary of every following year. Campus Account is an interest-bearing current account exclusively offered for university students with an interest rate of 4% p.a. The minimum account opening balance requirement is BDT 500. Any balance greater than zero will be eligible for interest. There is no Annual Account Maintenance Fee. Annual Debit Card Fee is BDT 300 + VAT. Salary Account is a local currency interest bearing current account for employees of different Corporate Houses to disburse their monthly salaries. Employees of MNC/LLC/MID CORP/NGO/Large proprietorship/Partnership firm, other than foreign nationals are eligible to open this account. Interest rate for Salary Account is 4% p.a. Any balance greater than zero will be eligible for interest. Interest calculation will be based on Daily Balance and Interest payment will be made Quarterly. There is no Annual Account Maintenance Fee in Salary Account. Annual VISA/MasterCard Debit Card Fee of BDT 300 + VAT will be charged upfront at the time of account opening and on anniversary of every following year. Fixed Deposit General is a non-transactional account that gives interest and principal at maturity. Minimum amount required to open the General FD account is BDT 10,000. FD General can be opened for 1/3/6/12/24/36 months. Interest is paid on maturity, calculated at 360 days, as per the Interest Rate Matrix. This account is available on a roll over basis until the customer authorizes its closure. 10% Government Tax shall apply to the interest amount. Freedom Fixed Deposit is a non-transactional account that gives interest quarterly to the link account automatically. Minimum amount required to open the FFD account is BDT 10,000. FFD can be opened for 6/12/24/36 months. This account is available on a roll over basis until the customer authorizes its closure. Interest is paid on a Quarterly basis after adjusting for 10% Government tax on the interest amount, as per the Interest Rate Matrix. Abiram Fixed Deposit is a non-transactional account that gives interest monthly to the link account automatically. Minimum amount required to open the Abiram FD account is BDT 10,000. Abiram FD can be opened for 12/24 months. This account is available on a roll over basis until the customer authorizes its closure. Interest is paid on a monthly basis after adjusting for 10% Government tax on the interest amount, as per the Interest Rate Matrix. Interest First Fixed Deposit is a non-transactional account that a customer uses for interest earning in advance and savings purposes. The unique feature of this product is that interest is given first at the time of FD opening. Minimum amount required to open the IFFD is BDT 10,000. IFFD can be opened for 3/6/12 months. Interest (after adjusting for 10% Government tax on the interest amount) is immediately transferred to the link account, as per the Interest Rate Matrix. Fixed Deposit Plus is a non-transactional account that gives interest and principal at maturity. Minimum amount required to open the FD Plus account is BDT 10,000. FD Plus can be opened for 89/150/360 days. Interest is paid on maturity, calculated at 360 days, as per the Interest Rate Matrix. This account is available on a roll over basis until the customer authorizes its closure. 10% Government Tax shall apply to the interest amount. Unit FD can be opened in local currency with the tenor of 12 months. Minimum amount required to open this FD is BDT 10,000. Each unit will cost BDT 1 (one) i.e. 10,000 units will cost BDT 10,000. Unique feature of Unit FD: it offers flexibility of partial encashment. This means customer will enjoy flexibility to encash any unit (1 unit = BDT 1) from the initially purchased Fixed Deposit units at any time before maturity. Partially encashed amount will receive 5.5% interest rate. The remaining (i.e. non encashed) amount of FD will be continued for the rest of the tenor at the initially agreed rate. Example: If a customer opens a FD of BDT 1.0 crore for 1 year at 12% interest rate and encashes BDT 40 lac after 6 months, then BDT 40 lac will get 5.5% interest rate for 6 (six) month period. Non-encashed amount of BDT 60 lac (i.e. BDT 1.0 crore – BDT 40 lac) will be continued for the rest of the tenor at 12% interest rate. If the partial encashment happens within 1 (one) month of FD opening, then customer will get back only the deposited amount and no interest will be given on encashed amount. Partial encashment will be allowed once within the tenor of the FD. This account is available on a roll over basis until customer authorizes its closure. Customers may obtain overdraft facilities or fixed loans against lien on fixed deposits. Flexi Deposit Premium Scheme is a non-transactional account that a customer uses for interest earning and savings purposes through monthly installment basis. Minimum amount required to open the FDPS account is BDT 500 and its multiples. FDPS can be opened for 1/2/3/4/5/6/7/8/9/10 years. Interest is accrued to the FDPS account on monthly basis. Interest (adjusting for 10% Government tax on the interest amount) will be paid at maturity date, as per the Interest Rate Matrix. Launching & coordinating lending campaigns to drive retail lending portfolio growth. Resident Foreign Currency Deposit (RFCD) Account is a foreign currency account. The fund in this account is kept as deposit. The account can be maintained in USD, GBP, or Euro. Any Resident Bangladeshi National, who has returned from travel abroad usually within the last 30 days, can open RFCD Account as per Bangladesh Bank requirement. Any amount brought in with declaration to Customs Authorities and up to USD 5,000 or equivalent brought in without any declaration, can be credited to this account. Interest in foreign exchange shall be payable on balances in such accounts if the deposits are for a term of not less than one month and the balance is not less than US $ 1000 or GBP 500 or its equivalent. Non-Resident Foreign Currency Deposit (NFCD) Account is an interest bearing foreign currency account. The accounts are kept in the nature of Term Deposits. The account can be maintained in USD, GBP, or Euro. The account does not have ATM or Debit Card Facility. Bangladeshi nationals staying in another country and earning foreign currencies or after their return to Bangladesh within last six months can open NFCD Account. Minimum amount required to open is USD 1000 or GBP 500 or equivalent currency in Euro. Non Funded Business is a combination of FCY buy/sell, Student File, Medical File, FDD/FTT issuance and other fee based service offerings. Our 11 (eleven) AD & Limited AD branches provide the service of FCY buy & sell, Student File, Medical File & FDD/FTT issuance. VFS Global is an international organization which works with different Embassies & High Commissions. In Bangladesh, they work with British High Commission, Canadian High Commission, Thai Embassy, Spain Embassy, Australian High Commission and Italian Embassy. VFS receives the visa application and passport of the visa applicants on behalf of Embassy and High Commission. BRAC Bank has booth inside all Visa Application Centers where we receive the fees and charges from visa applicants. A service charge is applicable for each applicant. IOM provides medical checkup facility on behalf of British High Commission among the visa applicant who wants to stay at United Kingdom for more than 6 months. BRAC Bank has booth inside IOM Sub-Offices & provides the cash management facility to IOM at Dhaka and Sylhet. A service charge is applicable for each applicant. A Zero balance account is an account which balance is approximately less than hundred taka or zero. For example, the account holder does not have any money in that account or have some money which is less than hundred taka. If these account holders don‟t do transaction within minimum six months then these accounts counted as Zero Balance account . A Dormant Account is a kind of account where there is no balance and no transaction happen from minimum six months to ten years. When there is no transaction happen within minimum six months to years then automatically these accounts are counted as Dormant account. So, in other words all the Dormant Accounts are Zero Balance account but all the Zero Balance Account are not Dormant Accounts. In my Internship Period my work was to call only the Dormant Account holders of BRAC Bank limited and the main aim was to convince those account holders so that they activate their Dormant Accounts and start transaction with the Bank again. Though I have worked on Dormant Accounts , I have seen the whole process of work on Zero Balance Account .The other interns who were working on Zero Balance Account their main aim was to give a reminder by calling to the Zero Balance account holders that they have an account in BRAC Bank and they need to deposit some minimum amount in their account within some weeks or a month. Otherwise these Zero Balance accounts will be deactivate and automatically will add to the Dormant Account list. While working on this project we, the interns had to listen to different kinds of customers experiences, complains ,compliments etc. More Than 50,000 accounts we found in the Dormant Account list of BRAC Bank limited throughout the country. When we listen to our customers about their experiences with BRAC Bank Limited we found out the reasons behind leaving transaction with the bank by the customers. The customer gap is the difference between customer expectations and perceptions. Customer expectations are standards or reference points that customers bring into the service experience, whereas customer perceptions are subjective assessments of actual service experiences. “Service Quality” is a critical element of customer perceptions. In case of pure service (Like ,BRAC Bank) service quality will be the dominant element in customers evaluation. “BRAC Bank Limited” the name itself automatically makes people think about first of all about world famous non-governmental organization “BRAC”. Before starting a relationship with any kind of service oriented organization people expect an excellent level of service where there would be no faults in the service. But in actual when they face the service lacks something their perception changes. One of the main reason behind more than 50,000 Dormant Account in BBL is Customer Gap. Customer often expects from Brac Bank that they would provide them with a world class service including more interest on deposit, less interest on loan, instant solution of any kind of problems without even going to the branch and many others. After their experience with BBL they realize that the bank has fixed interest rates which varies on different current or saving accounts, the bank don‟t minimizes or maximizes the rates for any particular person or for any VIPs also. If they don‟t do regular deposit within 6 months or more months the amount which is already deposited by that account holder earlier ,Bank itself will cut amount from that account as account maintenance fee .Even from the customer experiences we found out that they had to face bad behavior and bad experiences by the branch employees in different BRAC Bank branches all over the country. As a result of all these customer‟s perception changed from their expectation. So this is how Customer Gap grew in BRAC Bank Limited as because there were gaps between customer‟s expected service and perceived service. To minimize Customer Gap BRAC Bank Limited have started taking initiatives so that their most valuable asset which is their valued customers don‟t break their relationship with BRAC Bank Limited. They can‟t minimize or maximize their interest rates as because of BRAC Bank‟s fixed policy but they have started working on improving their service qualities. Most of the Dormant Account created ten years before ,seven years or five years ago. This kind of unexpected incident occurred because BBL was then a newly introduced organization. That time they were more concerned about developing organization‟s growth by opening more accounts but they didn‟t understand that these much account holders are dissatisfied by their service quality .In recent years BBL is providing such flawless service to their valued customers that Dormant Accounts are not creating that much and Zero Balance account holders are also interested to deposit money within weeks if they are given a reminder about their Zero Balance accounts. The first rule of service quality is to do it right the first time. 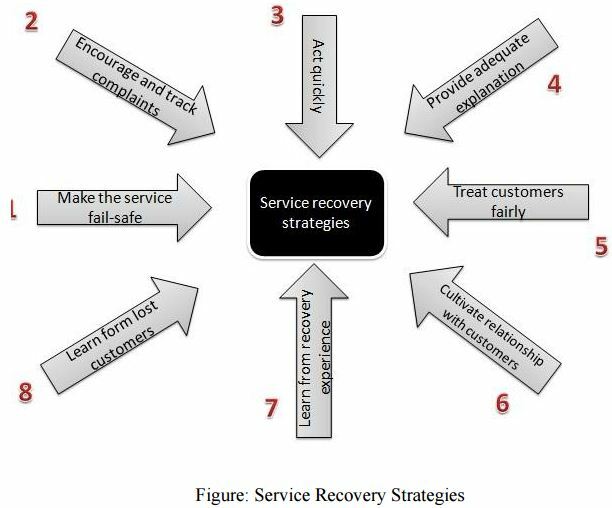 In this way recovery is unnecessary, customers get what they expect, and the costs of redoing the service and compensating for errors can be avoided. Like, sometimes in ATM booth ATM card goes within the ATM machine and customers transaction becomes hamper. In this case the ATM card goes to the opening branch from where that particular customer opened his account. Customers often think that once ATM card is gone within the machine means gone forever and for this reason many customers accuse bank and leave relationship with the bank. BBL try their level best to make their service fail safe that‟s why even the customer is not complaining still they are immediately (mostly the next day) bringing that ATM card to the opening branch so that the customer can get his old ATM card . In addition, throughout SMS banking whenever customer wants to know about his account we immediately send him the account statement because BBL wants to make their service fail safe and they try their level best to do it right the first time. BRAC Bank Limited has always encourage their customers to track any kind of complaints about the bank any time. For Customer‟s facility BBL has established a “Call Centre” which is 24 hours open for track any kind of complaints and also for other enquiries. BRAC Bank is promoting their call centre number which is “16221” in their each and every billboards, advertisements and also in the official website so that customer can easily contact with Bank if they have any complaints. Recently there has been introduced a new E-mail Id which is enquiry@bracbank.com. This E-mail ID is being checked almost everyday by top management so that they can satisfy customers by giving them proper solution of their complaints. It‟s a newly opened E-mail account about which we used to encourage our customers while talking with them in phone so that they feel a place of reliability that their complaints will not be wasted. Account listed customer we found out that he applied for a loan in BBL but the employee of that particular branch demanded bribe from that customer. The customer was so furious on bank that he didn‟t take loan from the bank and doesn‟t even want to run his account .As this was a serious allegation on Bank we handed over the phone to one of manager of head office and he listened all complaints and took detail information about that branch employee from that customer. Finally he apologized on behalf of that branch employee and ensured him that further this kind of incidents won‟t happen even he also gave that customer his personal contact number so that customer can contact directly to the head office‟s employee if he faces any kind of bad experience in any branch. In addition to that, this incident informed to that particular branch manager so that he take immediate action against that employee who asked for bribe. This is a very rare case and thus BRAC Bank Limited acts quickly. In many service failures, customers look to try to understand why the failure occurred. Explanations can help to diffuse negative reactions and convey respect for the customer. BRAC Bank Limited always provides adequate explanations to customers if needed. Dormant Account listed customers sometimes wanted to close officially their Dormant accounts mostly as they have another running account in BRAC Bank or in other bank. That time we were advised to tell them about their lien amount which they need to pay first in order to officially close a Dormant Account. Most of the time custome don‟t understand why they need to pay lien amount in order to close an account which is already deactivated. We used to explain very politely that though they don‟t use their account but the Bank has a responsibility to maintain his account as that customer didn‟t inform to close the account officially. Brac Bank has a fixed half yearly maintainance fee for each and every kind of account which varies from account to account. In this way Brac Bank always try their level best to provide adequate explanation to customer‟s queries and complaints. In responding quickly ,it is also critical to treat each customer fairly .Customers expect to be treated fairly in terms of the outcome they receive. As an example, when it‟s a question of Dormant Accounts activation Brac Bank treat their customers fairly. That means whether customer has a campus account or a triple benefit savings account it takes the same time which is maximum 3 working days for only activation of account. Then if they want to run their account safely they need to deposit such an amount which at least exceeds the lien amount. Thus they try their level best to treat their customers fairly. However ,its also beneficial for the bank because the satisfied customers spread positive word-of-mouth about BRAC Bank Limited. By conducting root-cause analysis,organization can identify the sources of the problems and modify processes, sometimes almost eliminating the need for recovery. When BRAC Bank‟s top management observed that so many accounts are in Dormant list they made decision for starting this project. The main aim is to motivate the customers so that they activate their account. On the other hand, when we used to call those customers we used to asked why they didn‟t continue their account or what kind of problems they are facing from BRAC Bank. Sometimes customer himself used to tell us about their bad experiences. Some customers complaint about they don‟t find ATM Booth near to their houses or some of them had to wait for long time in branch and many more reasons like that. We used to listen all these very attentively, note down each and every cases specifically and used to share these with our supervisor. Our supervisor and other top management used to sit for meetings with all these findings. According to all these they took necessary steps to satisfy customers. As now they know the root causes for all these Dormant Accounts its much easier for them to satisfy customers. The Dormant Account holders whom we could not motivate to activate their accounts they are the customers whom BRAC Bank Lost. Customers complaints were so serious and they were so furious on Bank still we apologized on behalf of Bank. We tried our level best by saying about improvements of our service in order to stop them from breaking relationship with bank. Still, We lost him and there we learned that service quality is one of the most important thing for a bank. After working on a huge list of Dormant Accounts of BRAC Bank Limited as an intern I realized this project is very effective process for activation of Dormant and Zero balance accounts. 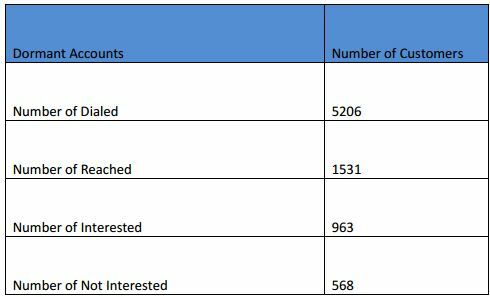 Most of the Zero Balance account holders started their transaction within our three months of internship as the IT department reported to Head office but there were less Dormant Account holders who activated their accounts. To convince and motivate Dormant account holders is such a difficult job as most of their accounts have been deactivated for last 5 to 10 years even. In the meantime they have already switch to another bank. Within 3 months of my internship I have dialed more than 5000 numbers of account holders but I found most of their number either have changed , didn‟t receive calls , some of them are dead etc. 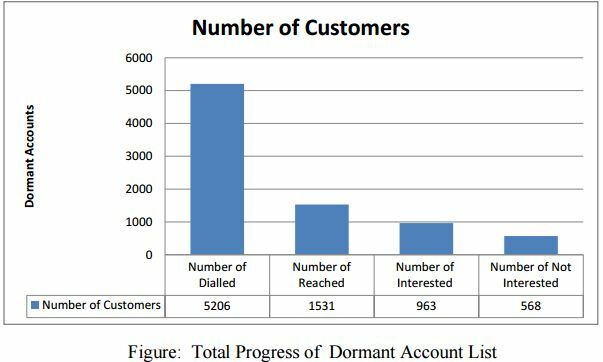 Among 5206 dialed numbers received calls are1531, interested to activate dormant accounts are 963 customers and 568 customers want to officially close their accounts. However, apart from working on Dormant List I have sometimes work under Supreme Banking, mailing different branch managers, calling relationship manager of supreme banking etc. All these works I found interesting because all these different tasks refreshed me when I felt a little bore by calling Dormant Account holders at a stretch for long three months. Efficient Information Technology Division of BRAC Bank Limited. They systematically checks if there is any illegal software installed in any computer and then they take action. They even keep record of which computer has tried to enter to restricted websites. BRAC Bank Limited makes sure that their employees are getting good facilities. BRAC Bank Limited has a child care centre within the premises , a canteen containing reasonable foods , a medical centre, a library, prayer rooms and many other facilities. The corporate culture of BRAC Bank Limited the employees can only leave the office after their boss leaves. The environment of BRAC Bank is very friendly and people address their seniors “Bhai” and “Apa”. All the employees here make sure that papers don‟t get wasted , used papers that have other side blank are utilized. This refers that they are taking green banking initiatives. According to BBL , there are set of rules regarding qualitative customer service such as good greeting , good closing . appropriate information, keeping a smile, being patient etc. The fact is many employees specially those who work in different branches of BBL don‟t have the right attitude. 3 months practical real work experience, 3 day training with certificate . Moreover it adds value to the CV. Applying knowledge and skills in work related situations ; helps to find out what one can do and what one needs to work on which helps to clarify career goals. Established a network of contacts ,mentors and references that will be valuable for future letters and support. Exposure to real world helps to create confidence and improve communication skills. Not Involved with direct operations of a bank. Worked as a representative of a reputed organization like BRAC Bank Limited. Gained knowledge and experiences about Retail Banking Division directly. Risk of negative response ,bad comments about bank etc from clients while talking through phone. Risk of unintentional information sharing as everything is supposed to be confidential. Risk of getting late at office which can create bad impression. Although BRAC Bank have 350 plus ATM booth to serve the existing customer but this number is not enough. When we call the customer most of the time they claim about this that they are not getting the services all over. So to improve the banking experience of the customer BRAC Bank should increase the number of ATM booth. CDM machine is a new feature of BRAC Bank Ltd and for a pilot basis they implement this to some specific branch in Dhaka. However from Zero Balance project we get to know that customer are more interested with this CDM machine and if it will implement to all over the country then customer will be more satisfied with their desired services. So BRAC Bank should increase this CDM machine number to give the customer prompt services. Sometimes customer complaints about that they are not getting the proper solution to their problems which they are facing at the bank. For example, some customers complained that they went to the branch in order to activate their dormant account with their national Id card‟s photocopy but many branch doesn‟t even know what BBL needs to activate a Dormant account. Branch people most of the time tell to customers that firstly they need to deposit the lien amount (which consist of mostly the account maintenance fee ). The fact is to activate a Dormant Account customer only need to submit a photocopy of national Id card and after activation he have to deposit more than the lien amount and BBL will adjust the lien amount from the deposited money. These kinds of situation need a proper solution. BRAC Bank should careful about this type of problems and provide the better solution to the customer. Customer often complaint about Gulashan branch,Motijheel branch, Mirpur branch,Banani branch,Board Bazar branch.Pabna branch,Barishal branch and many other branch of BBL that their services are not up to the mark specially the bad behavior of branch employees.These things actually discourage them to continue transactions with BRAC Bank Limited. So, Bank‟s personnel need to be very careful and sincere about their services which should be quality service to their customer because the ultimate success lies in providing the quality services to the customers. By working this Zero Balance & Dormant Account Project I get to know that customer wants to communicate to the bank‟s authority for their complaints and lot of queries. Although Customer Experience Department are there to solve customer complaints and queries but direct or easy communication is not there. So bank personnel should set up some strategy so that the customers can easily communicate. To conclude, it can be said that it was a lifetime experience for me to work in the “Zero Balance And Dormant Account Project” and gather knowledge from it. BRAC Bank is an organization who tries to establish their services and they can improve their services through low price services with skilled services provider and Zero Balance And Dormant Account Project is a successful initiative of it. Project we see the difference that BRAC Bank utilizes this Zero balance account and Dormant account and the result is obviously the huge fund they get from this. Finally, it can be said that the ultimate success comes by dedication, commitment and dynamic leadership of the management committee and in this Zero Balance And Dormant Project of BRAC Bank Ltd, all of those are present and for that reason the project gets the ultimate success.